guests seeking luxury and quality just a few paces from the sea. 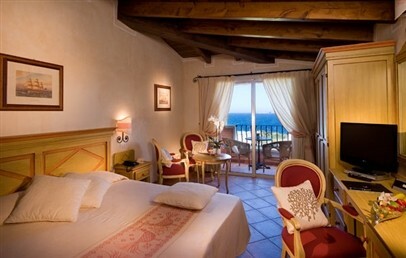 The Colonna Resort is located in the bay of Cala Granu, just a short hop from the Porto Cervo Marina. Cala Granu is a beautiful bay where the intense green of the vegetation and wild rocky headlands are combined with a crystal blue sea, creating a scenery of rare beauty. 2 km from here is Porto Cervo Marina, one of the most comfortable ports in the Mediterranean. With 700 berths, this marina is the true heart of Porto Cervo, and every year hosts the world’s largest and most luxurious yachts. The village of Porto Cervo is located 4 km south from here. In addition to all that, there is the immense cultural and natural heritage of Sardinia and particularly of this region called Gallura. 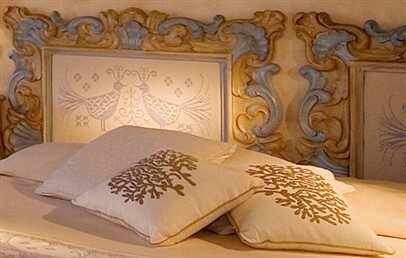 The elegant architecture of Colonna Resort, typical of the Mediterranean, fits harmoniously in the 50,000 sqm of park. Right in the middle of it, an impressive 8,500 sqm large swimming pool stands, the largest salt water pool in Europe. The area is so vast that at any time of the season guests can enjoy pleasant moments of relaxation, away from other sun beds. 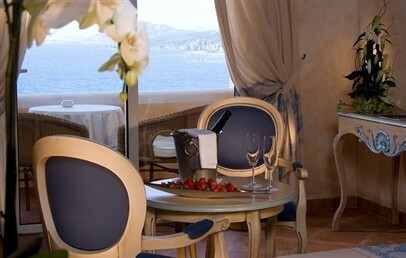 The hotel offers its guests 250 rooms, including several Deluxe and Suites, most of which enjoy an enchanting view. The two restaurants offer an attentive service at every meal and a refined and tasty cuisine. 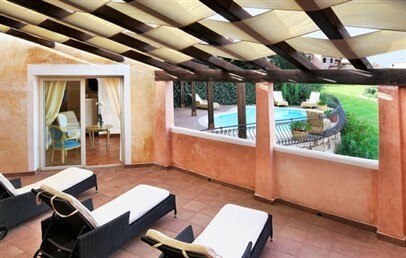 The Colonna Resort provides also a Conference Centre, two bars, a Spa, a cardio-fitness room and a heliport. 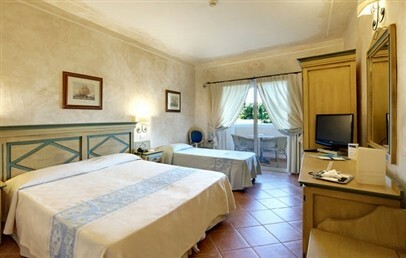 The 250 rooms of the Colonna Resort are arranged in different floors and can be easily reached using several lifts. Most of them enjoy a breathtaking sea view. Sitting on the balcony of your room watching the sun rising from the sea, will be an experience that you will hardly forget. The rooms are tastefully furnished in Mediterranean style and offer Satellite TV, bath with tub/shower, hairdryer, minibar, Wi-Fi internet connection. Standard double room of about 20 sq.m. 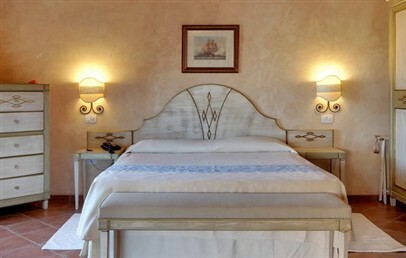 Deluxe double room of about 30 sq.m. The Suites face all the sea and can be chosen from the smallest one Executive to Royal and Presidential (bigger as Royal) until the majestic one, the Suite Imperial. 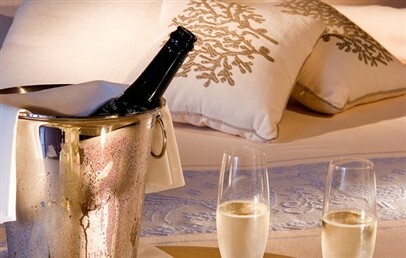 Their setting and their position are unique and are the most exclusive of the hotel. Some are equipped with a bar counter, several TVs and a spacious veranda with lounge, sun beds and a pool with Jacuzzi on the terrace. The sandy beach of the Resort lies in the middle of the rocky coastline, therefore it is not very large. It is extremely well-kept and carefully attended by the hotel staff. Thanks to the particular surrounding with a lots of nature, makes this beach an exclusive place for the guests of the Colonna Resort, so they can enjoy the clear blue sea water of the Costa Smeralda in absolute peace and tranquility. A wooden pier goes out on the sea to give the possibility to small and medium yachts and boats to dock. The SPA of the Colonna Resort covers an area of over 1000 sqm, and offers its guests an indoor swimming pool with heated sea water and spacious seats with massage jets, Turkish bath with 45°C and 90% humidity, Finnish sauna, emotional showers. Adjacent the SPA is the fitness area with Tecnogym equipment for cardio and muscle training. There is also a relaxation area where guests can relax sipping a nice herbal tea. Last but not least there is the possibility to choose among a range of different massages, performed by experienced and qualified staff. The sports activities at the Colonna Resort include the gym, a golf driving range and tennis (the closest field is at 1 km distance, comfortably reachable with the free shuttle service. The main restaurant is the Colonna Restaurant which can accommodate up to 500 people and has also a wonderful terrace facing the sea, with a capacity of 300 people. The Colonna Restaurant opens in the evening from 20h00 to 22h00 with an à la carte service and guests have the possibility to enjoy a romantic candlelight dinner. The chef is one of the best on the Costa Smeralda and he will amaze you with his tasty creations, inspired by the traditional Sardinian and Italian cuisine. A formal dressing is required. Near the swimming pool is the Pagoda Beach Restaurant with a beautiful sea view. Here is served the lunch with a buffet from 13h00 to 14h30. In some occasions the Pagoda Beach Restaurant turns into an exclusive restaurant for groups and gala dinners. Moreover there are two bars, the Colonna Caffè, open from 10 am until midnight. It is an elegant lounge overlooking the sea and the swimming pool, the ideal place to enjoy a drink at sunset or a cocktail after dinner. Near the pool is the Beach Bar, open from 10.30 am to 7 pm, perfect to enjoy a quick snack or a fruit cocktail. At the Colonna Resort guests may practice different water sport activities, further more there is a boutique, a heliport and meeting rooms and free access to internet with Wi-Fi connection. 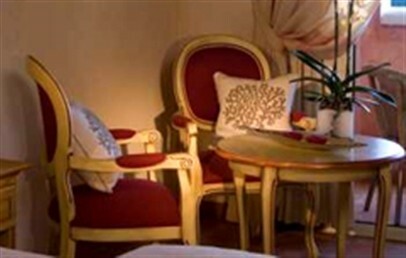 Elegant rooms, furnished in Mediterranean style and offer following comforts: Sat TV, hairdryer, minibar, safe, tub with shower, free Wi-Fi connection. Equipped balcony with garden view. Elegant rooms, furnished in Mediterranean style with comforts as: satellite TV and SKY, hairdryer, safe, minibar, tub with shower, free Wi-Fi connection, equipped balcony with beautiful sea view. Elegant rooms, furnished in Mediterranean style and offer several comforts as: satellite TV with SKY, tub with shower, hairdryer, minibar, safe free Wi-Fi connection. An equipped balcony with garden view or sea view. 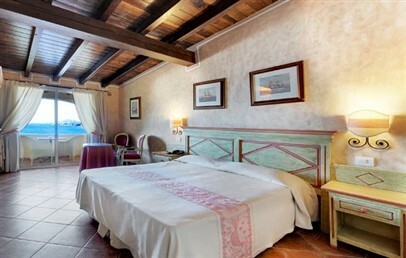 The Suites have all a awesome view on the sea and offer spacious and elegant rooms. The Executive Suite has a living room, a double bedroom, two bathrooms, a Jacuzzi tub and a covered balcony. Moreover it offers several comforts as: free Wi-Fi connection, satellite TV with SKY, minibar, safe and hairdryer. This Suite can accommodate up to a maximum of 4 people. 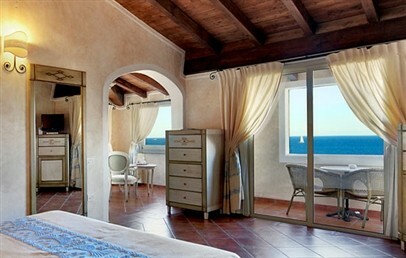 The Suites have all a awesome view on the sea and offer spacious and elegant rooms. The Suite Royal has a living room with sofa bed, large double bedroom, two bathrooms, a Jacuzzi tub and a covered private balcony with a bar area. Moreover it offers several comforts as: free Wi-Fi connection, satellite TV with SKY, minibar, safe and hairdryer. This Suite can accommodate up to a maximum of 4 people. 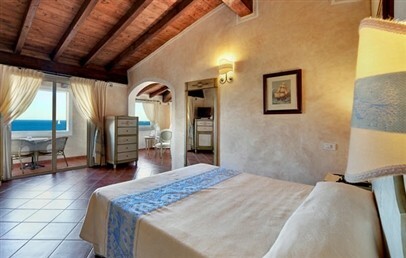 The Suites have all a awesome view on the sea and offer spacious and elegant rooms. The Presidential Suite has a living room with sofa bed, a double bedroom, two bathrooms, Jacuzzi tub, veranda, private pool. Moreover it offers several comforts as: free Wi-Fi connection, satellite TV with SKY, minibar, safe and hairdryer. This Suite can accommodate up to a maximum of 4 people. 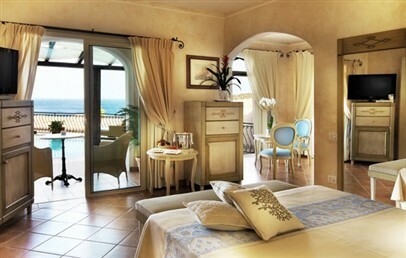 The Suites have all a awesome view on the sea and offer spacious and elegant rooms. The Suite Imperial is the biggest one and has a living room with sofa bed, two double bedrooms, four bathrooms, Jacuzzi tub, a covered balcony and private pool. Moreover it offers several comforts as: free Wi-Fi connection, satellite TV with SKY, minibar, safe and hairdryer. This Suite can accommodate up to a maximum of 6 people. Elegant rooms, furnished in Mediterranean style offering following comforts: Satellite TV and SKY, tub with shower, hairdryer, minibar, safe, free Wi-Fi connection. An equipped balcony with view over the Mediterranean scrub.